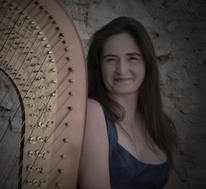 Héloïse Dautry studied harp with Evelyne Haut-Labourdette at the Conservatoire National de Montpellier where she won First Prize in 1996 and with Brigitte Sylvestre at the Conservatoire National de Paris where she graduated in 1999 with the First Prize for harp; she has also studied with Marie-Claire Jamet and Fabrice Pierre. She is a frequent performer of contemporary music and has worked with composers such as Kaija Saariaho, Örjan Sandred, Georges Aperghis, Jean Batigne, Shuya Xu, Eric Scrève, Dragan Latincic and Christophe Maudot. In 2004, invited by the Berlin Philharmonic, she performed Terrestre of Kaija Saariaho, with musicians Garth Knox, Anssi Karttunen and Camilla Hoitenga. In 2009 she performed at the Ultraschall Festival in Berlin and has also performed at numerous concerts and music festivals including a special Harp day dedicated to works by Kaija Saariaho at the Castle of Fontainebleau, Berliner Festspiele, the Kölner Philharmonie, the Berliner Philharmoniker. In 2001 she toured in Azerbaijan. She is now teaching harp at the Conservatoire National de Montpellier.